A Palawan father leapt into a river and repeatedly bit and punched a saltwater croc to free his 12-year-old son from its jaws. Superintendent Socrates Faltado, of Balabac police, said Tejada Abdulhasan took action as the crocodile was dragging his son, Diego, into the depths of the river at about 6pm on Friday (January 25). Diego and a younger brother had been washing in the river at Sitio Mararango when the crocodile suddenly appeared and took hold of his left arm. As Diego struggled to free himself, his brother ran to their nearby home to raise the alarm. Without hesitation, Mr Abdulhasan ran into the river and began punching the croc in the head. As this seemed to have little effect, the father then began to bite the soft flesh on the inside of one of the beast’s legs. After a few minutes of this treatment, the bloodied creature, having been given a taste of its own medicine, released hold of Diego and fled the scene. “Fortunately and due to the bravery of his father, the victim did not drown. He only suffered wounds from the crocodile bite,” Supt. Faltado told online news site tempo.com. The boy was rushed to the Balabac Rural Health Unit. He was then referred him to a hospital in Brooke’s Point for further treatment. He sustained gashes on his arm and legs, wounds in his pelvic area, cuts to his face and an eye injury. The attack on the boy is the first recorded this year. Last November we reported on the death of fisherman, also on Balabac Island, following a crocodile attack. Following a hunt, an enormous saltwater croc was captured nearby. 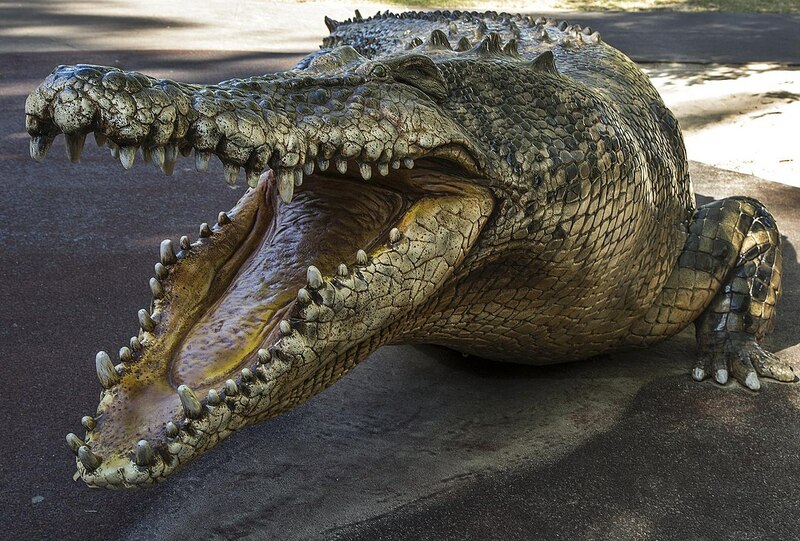 Later christened ‘Singko’, the 15.6ft beast was transferred to a crocodile sanctuary in Puerto Princesa. I’m no croc expert, but this story is puzzling. Crocs and gators normally chomp hard and hold on while they twist rapidly and powerfully until their victims are mangled to death. Why would this croc simply bite and remain still enough for the dad to bite it? I’m glad the boy is alive. Story is obviously fabricated, and from the types of injuries, seems like an attempt to cover up child abuse. I hope there was an investigation.